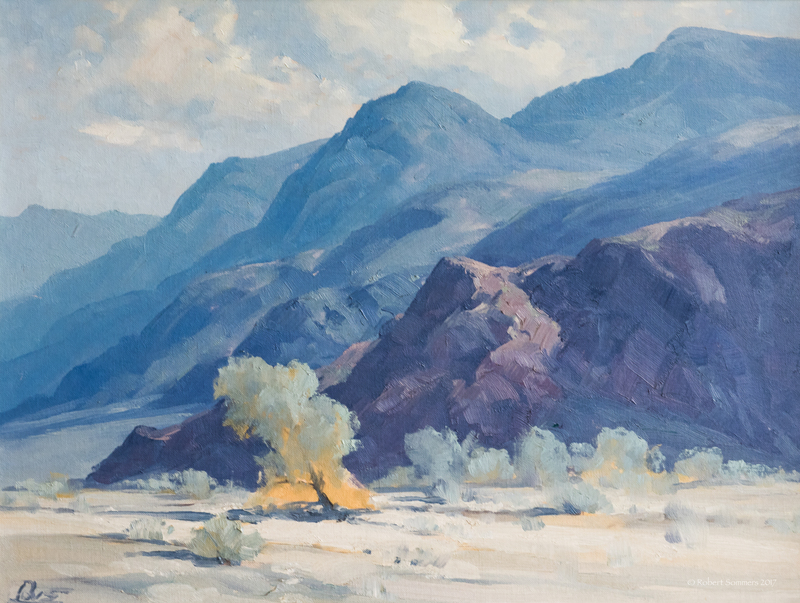 Ralph Love (1907-1992) Smoke tree and canvas oil on canvas, 18 x 24″ signed l/l p.o.r. Ralph Love The Grand Tetons o.b. 14 x 18″ original frame. p.o.r. From AskArt: Ralph Love was born in Los Angeles, California April 18, 1907. He died May 26, 1992 in Escondido, California.For many years, Ralph Love taught as well as painted. His students were made up of avid artists throughout Southern California, and their classroom was the wide-open spaces. On rainy days, the class would meet in the old Art Shack in Temecula, California, which Love opened in the mid-fifties. It was from this Art Shack that his work received national recognition. Love’s desert scenes are immortalized in Palm Springs at the Palm Desert Museum through dioramas. Another of these unique displays can be seen at the historical Mission Inn in Riverside, California. The Frontier Museum in Temecula, California has honored Ralph Love in their museum publication with two pages of his contribution to the area through his art. The late Erle Stanley Gardner, who commissioned a Love painting of his ranch, is the only other person in this publication. 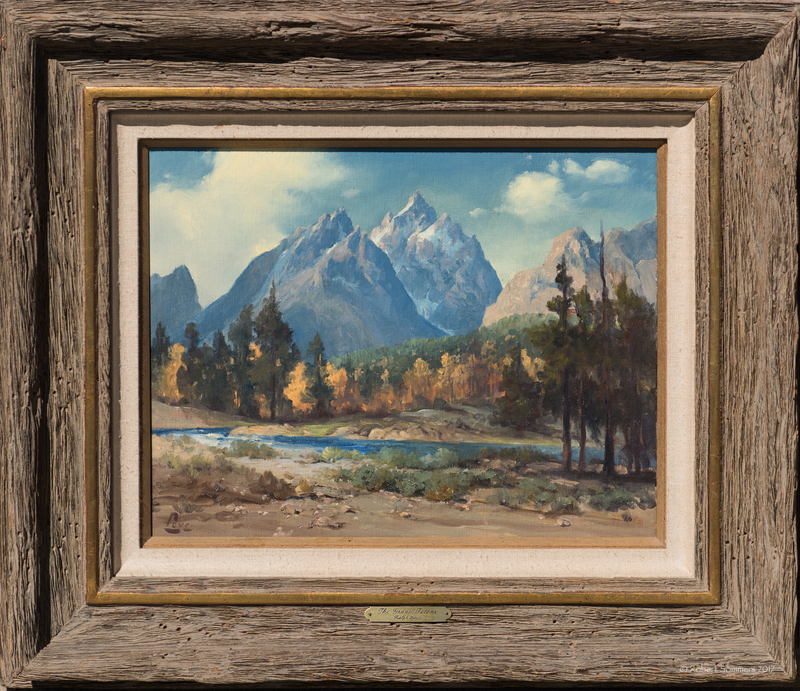 Ralph Love paintings are hanging in several other museums throughout the West, including the Noirthern Arizona Museum in Flagstaff, Arizona, the Phillips 66 Museum in Oklahoma, and the Leanin’ Tree Museum in Boulder, Colorado. Ralph Love is listed in “Who’s Who of International Art”, in the Tenth Anniversary edition of the “Southwest Art Magazine” hardcover contemporary artist listings, Prize Winning Paintings published in New York, and has been featured several times in Southwest Art, Artist of the Rockies, Western Art Digest, and Art of the West. He is listed in the Edan Hughes reference book of Early California Painters from 1840 to 1940. Ralph Love received no formal art training, but was literally self-taught. It was when he was about eleven or twelve, his teacher took the class to the Los Angeles Museum of Art, and he discovered what he wanted to do. He remembered standing in front of one of the old Flemish masters, and it just came to him. . . “I can do that!” And he did. As a young artist, he had the privilege of painting for two years with Sam Hyde Harris. This was the only real “formal” training Ralph Love had. The rest was from avidly devouring all the art books in the library he could find.